If you are interested in becoming a volunteer on the Lynden Fire Department, phone the station during normal business hours, 354-4400. Your name and contact information will be taken. 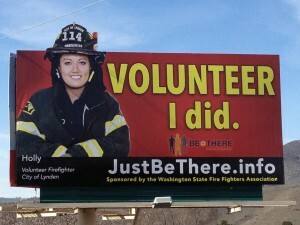 Lynden Fire Department accepts applications for Volunteer positions one time per year. We do this just prior to the Fall Fire Recruit Academy starting. We will invite you to an orientation meeting and at that time you will submit your application. The process will be explained at that time. An interview with the Department Officers will be scheduled. A pre employment written test will be scheduled. You must score at least 85% on this test in order to proceed. The next step in becoming a volunteer is taking a physical agility test. The last step is a pre-employment physical provided by the Department. Once you’ve cleared these steps you are officially on the Department and will be issued your gear and prepare to take part in the Fire Recruit Academy. During your first year on the Department you will go to the County Fire Recruit Academy. At the Fire Academy you will earn your Firefighter I certification. During the second year on the Department you will go to an Emergency Medical Technician class. Classes for both programs are Tuesday and Thursday evenings and Saturdays. After you successfully finish the Fire Academy & EMT class you are committed to serving one year with the Fire Department. Each of the classes, Fire Academy & EMT, cost $1200. You are expected to pay $600 of that cost. After serving with the City for one year after completing FF I and EMT certification you will be reimbursed your $600 investment. As a member of the Department you will be on duty for a 12 hour shift or a 24 hour shift depending upon scheduling. When you aren’t on duty you are still encouraged to respond to all fire calls–many people are needed to fight a fire. You will be paid the State set minimum wage rate per hour while on duty. Training is on Wednesday evenings and it is mandatory. All of the members of our Department are very proud of this Department and support each other. We strive to be the best Department in the County. We welcome new volunteers and recommend you give serious consideration to the commitment you would be making should you decide to pursue volunteering as an Emergency Responder for the City of Lynden.